Planning menus has never been easier. Health-e Meal Planner has everything you need to plan amazing, compliant menus, from entering production data to creating purchase orders. With everything synced in the cloud, everything you need is at your fingertips. We spoke with Stefanie Burkett at East Valley recently about how Health-e Pro helps her manage her foodservice program in her district--from reports to carb-counting nurses to how her smoothly her Administrative Review went. How did your Administrative Review go? It went well! Our auditor wanted to see everything how I see it, so I got her a read-only license so she could get into Health-e Meal Planner without me having to print everything. She logged in and was able to easily review everything. She liked that Health-e Pro was easy to use. She described working in the software as using it in layers. You click to open the menu, then you click into the recipe, then into the ingredient, then into the spec sheet. It’s so easy, intuitive, and connected. How did HMP help you prepare for review? EZ Review was really good; I liked knowing what to look at and what to fix. Another thing I really liked about the service was it corrected a lot of errors I had made in the past. When you are new to a program and not totally sure what you are doing, you can make a lot of errors in the beginning, so this EZ Review service was able to catch those mistakes for me. That went super smoothly. It taught me the mistakes to look out for. I couldn’t actually imagine having a review without paying for that EZ Review service. I had quite a few errors. EZ Review was a key piece. How does your nurse use Health-e Pro? Products are always changing and my nurses always need allergen information and carb counts. A lot of my recipes are combined; for example, beef dippers with rice. My nurse is able to login to Health-e Pro and say, for example, a kid only wants rice; she can find the carb count for the rice. She can also log in and see the spec sheet herself; I really like that because it takes a lot of pressure off of me. How has Health-e Meal Planner made your program more compliant? It helps me make sure we are compliant. A lot of ladies in the kitchen use the meal group report, which shows how each menu item is credited. Now that they can look for themselves, that has streamlined our department. I was able to get all my kitchens a tablet so they can be in Health-e Meal Planner in real time which makes compliance easier, too. Another thing is our products change constantly, so just because I printed the production records two weeks ago using a specific brand of chicken nuggets, it changes, so then the printed record is no good. Instead of having to reprint reports constantly, with the kitchens actually having a device, they are always current. Before Health-e Pro, any time a change was made, I would have to call all my kitchens and the nurse and let them know of any changes and send them over new recipe, but it gets to the point when I am resending constanty, so they don’t know which one is correct or out dated and neither do I after a while. With everyone now being able to login to Health-e Pro, it is so much easier to keep up with changes. My staff love online production because they know what is going on. Before online production, menu changes were all over the place. Now I can say something changed on the menu, just check in Health-e Pro to see any changes, and that’s it. It is so easy! They can see what I am doing real-time! What reports help you the most? I personally love is the shopping list--I use that all the time. I send it to each site because they order their own food. Each week, I send them the shopping list, they order from the list and then I combine all sites and put it into the program. Software is only as good as you make it. You have to invest. Any computer software is as good as what you invest in time to learn it correctly. If you don’t change things or update it as it comes up, it’s not going to be any good for you. We signed a multi-year contract with Health-e Pro right before free state-wide software was announced. I was worried how I was going to justify the cost, but when the reviewer was here, I asked what she thought, and said that just because something doesn’t cost any money doesn’t mean it is free. I’ve put the investment of my time into Health-e Pro and it is working well for us--I’ve already gotten my investment back with it. I passed my audit with Health-e Pro, so clearly it is working. Keri DuBois-Gould, Director in the Quabbin School District in Massachusetts, has been with Health-e Pro for three years now. Recently we spoke with her to hear her story with Health-e Pro: how has the software made her job easier? What is she able to do in the software from her phone? And what’s the ultimate result of using Health-e Pro for Keri? Read on to find out more. What do you love the most about Health-e Pro? Oh, it’s so easy, I love it. You guys understand school lunch. I could sit here and enter a recipe on my phone, that is how easy Health-e Meal Planner is. What else have you done on your phone with Health-e Meal Planner? I can update my menu on my phone. I’ve scaled recipes on my phone or calculated MPLH. What is the major difference before and after using Health-e Meal Planner? Four years ago, I started in this district and I started with another software as their menu planning software. It was not user friendly and difficult to get data in, so I didn’t really utilize it. I started looking into programs and found Health-e Pro. 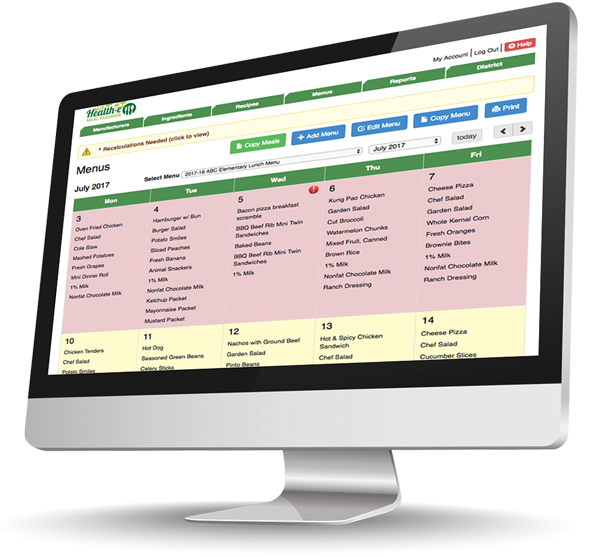 I worked for contract food service companies before school food service and healthcare before that, so I wasn’t brand new to programming or training staff on menu planning.I have worked with a lot of systems and Health-e Pro is just easy. I don’t have to make up everything in Excel spreadsheets. I used to have to create my own production records, but now my staff can just enter it all in online. What made you decide on Health-e Pro? One reason I got Health-e Meal Planner was because it was all my menu planning in one. It has my “back-of-house menu planning and production” but also the front end to publish menus for parents and the Mobile App. I don’t have to upload anything into a separate program--it’s all in one program. When I started training with Lynn, it was supposed to go over three days. We did it in one day because I wanted to get started and program my menus; within a couple weeks, I had my menus in. How was training your staff on production? It is user friendly for them. They can print off production worksheets and then at the end of the day come in front of their computer and enter it in. Once my staff realized that, it’s much easier. As a director, what is the biggest benefit of online production records? When you have your production entered, you can run a Usage Report so you aren’t looking through months of production data to see how much you prepared of a menu item; that helps a lot. This past week I had to cover one of the staff members and I was able to run the usage report to see how many they prepared the last three times and I could estimate what I needed. Whereas years ago, you had to estimate how much was needed or go back in the files to see any old data. But now because since we use online production records, it’s there and we have access to it. We had a state auditor in and she loved all the reports we had. I use the MPLH report in the Business Insights Dashboard and it helps justify if we need to reduce hours or increase hours at school, so it is really cool how it runs for you. What has exceeded your expectations? Just how easy it is. I show people how quick and easy it is to find products in the manufacturer’s tab in Health-e Meal Planner. I am always telling any of my vendors they need to get in Health-e Pro, so people can use their products more! As a director, I think we spend too much time on our office, but with Health-e Pro, it has allowed me to get out into my high school more. What has your experience with Health-e Pro been? I am a new FS director, I took over for a director that was here for 39 years, so I had some big shoes to fill. I worked with Health-e Pro a a couple years ago, so when I became the director here this year, I decided I needed the program, it is amazing. We actually just started our new menus this week which was so fitting. Our lunch count went up significantly. Just recently, we served about 200 more meals than the average daily, to give a rough estimate; that is the easiness of the meal program: being able to look up different recipes and using all the shared recipes I can incorporate into my meal pattern. It is amazing being able to offer different fruits and vegetables you wouldn’t think about--like the lemon caesar pasta salad we served Monday. The kids loved it. They were raving about it. Do you think meal counts increased because you had the flexibility of having new recipes and being able to switch out for new ones? Do you use the online menus? Our menus are up to show nutritional information, but I also have separate menus for parents to print out because that is very familiar to them. I am also activating the mobile app so parents can see everything. How was your nutrition department before you had Health-e Meal Planner vs after? You mentioned participation increasing; would you say that is the biggest change? Oh yes, just the amount of variety we have access to with Health-e Meal Planner. In our elementary schools, we were having chicken nuggets and juice almost everyday. I am shying away from that and now I am serving fresh fruits and veggies. We are serving carrot sticks with ranch dressing and we ran out it was so popular in our high school. But that is okay because we are going to forecast from here on out and we will be able to use Production to help us do that. Just think about all these different options we have on our menu now! What is the easiest part about Health-e Meal Planner? Honestly, whatever my thought is just typing it in the recipe box and seeing a recipe I can use. Sometimes I will look at different districts that I know use Health-e Meal Planner and see what they are serving to get new ideas and brainstorm because we aren’t in competition, we are here to help each other. What has exceeded your expectations since using Health-e Meal Planner? Everything that you offer: production records, on-site production records, EZ Admin Review Report, and that you can choose one day and the meal components are laid out for you. Everything is laid out for you. There are so many aspects of the program that make my daily workday easier with menu planning. Another thing is the reporting. This is a huge one! I put together monthly binders for our nurses with the carbohydrate report in it for their schools and menus. Our district nurse called me letting me know one of the other nurses really loved the carb count binder. They also can see it on My School Menus; they said it was the most helpful thing for their diabetic students, so that was very assuring that I was able to do that. Are there any other reports that stand out to you? Besides the carb count report, the production one is really helpful. How has your staff done with production records? The staff really likes it. They have been really helpful for all my managers and cooks. What do you like the most about the production records? The flexibility of exporting it and being able to customize it so it is clear to my managers. There is so much new being thrown at them, so I love how Health-e Pro gives me the flexibility to print them. What do you love the most about working with Health-e Pro? That’s tough. I love it all. I love that I can know menus are in compliance and see visually if I missing an item for the day or the week. I love that our parents and staff, especially nurses, rely on our online menus a lot for carb counts with students with diabetes and also allergies. What sold you on getting Health-e Pro? Knowing that your menus are in compliance with the guidelines. This was my main motivator to bring it into the district. What has exceeded your expectations with Health-e Meal Planner? Training sessions were really helpful. When I first started, I had our scheduled training, but I was also able to call the training line and get a hold of someone in a pinch. I found that very helpful; I didn’t have to wait on my training to get my question answered. What's the main reason you would recommend our product? Simple to use, menus are in compliance, and parents and staff can use it for any type of allergy needs. So three things! When I first started, I met with our school nurses one-on-one and taught them how to navigate the website to see nutrients, especially carb count. Now that they use it and are familiar with it, they love it. It has been a great tool for them and made their lives easier than tracking us down for every single menu item.